After opening the first door in The Axix, I thought this is going to be old-school . 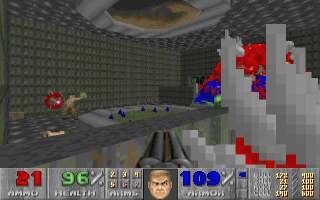 While it's a big level and the text file states that it requires an unlimited source port, it's not that uncommon for people to update old levels for Boom, and one look at the spartan grey corridor starting this level made me think that must be the case - it fleetingly reminded me of Refinery (Doom E2M3). After my first few attempts at the start area I was even more convinced - the first yard is horrible, far too brightly lit, with a whole series of big metal doors down one side and decorated in STARGR textures. Coupled with the fact that there were no weapons, almost no ammo, and too many monsters to take on comfortably with a pistol, and I thought some prankster had relabled some old Doom 1 nightmare PWAD as a Boom level as a practical joke. But I beat the start area and pressed on, and found that The Axix is in fact a pretty good level. The player is made to work hard for every weapon - you have to fight past many rooms before even getting the shotgun, and the only other weapon you get early is the chainsaw - which you'll need, because ammo is very limited early on. You won't be thankful when you do get a better weapon though, as they are usually accompanied by another step up in traps and heavyweight monsters. That said, there is plenty of ammo later on, and the fights are fair and generally spacious; there are some secrets around that are very helpful, too. It's a big level, and I liked the way the player was often forced to make large diversions through side areas, eventually arriving on the other side of some obstacle and able to clear the way forward. There are some good traps as you get further into the level. The architecture improves too; the main area sticks well with the Shores of Hell (Doom 1 episode 2) style, with some good industrial areas including a large crate warehouse. The outdoor yards each have an interesting layout. 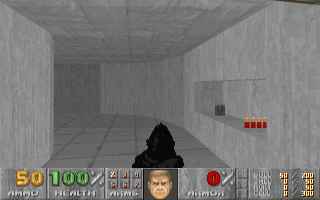 The style later in the level shifts toward the high-tech with more computer panels and more use of Doom 2 textures; there are some really quite detailed and impressive rooms later on. There's quite a good maze you have to work your way through as well - however this, and a few other areas in the level, are spoilt by extreme flashing lights. Good placement of flashing lights really add to the sense of an unsafe environment - but when you make a whole maze, which the player will be stuck in for several minutes, flicker between bright and pitch black, well that's just a recipe for a headache. Or maybe I'm just going soft. Overall, The Axix is a really strange blend of styles, with plenty of good action, but some frustrating aspects as well. axix.zip, size 206kb, date 2001/04/12. AXIX.WAD, size 745kb, date 2001/04/12. axix.txt, size 4kb, date 2001/04/12.